With Book Two's first-draft deadline swiftly approaching, I've been working harder than ever to get my daily writing in and my daily distractions down. That means cutting back on Facebook, Twitter, and all the other delightful corners of the Internet that always seem more fun and fruitful than actually, like, working. 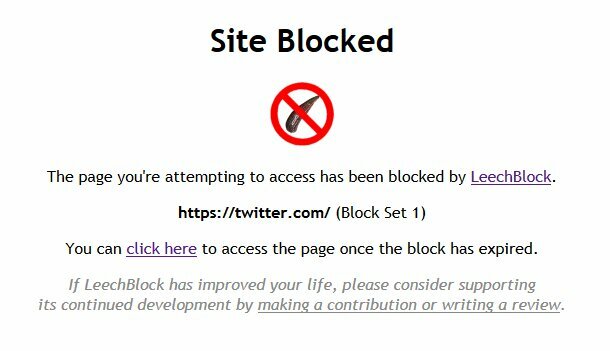 The best weapon I have against that is my go-to automatic page blocker: Leechblock. It's an add-on for the Firefox browser that allows you to list certain websites (like Facebook) that you'd like to restrict access to (say, allowing yourself no more than ten minutes per hour from 9am to 5pm, Monday through Friday). It's a snap to set up, edit, and (should it prove too much for you, you weak-willed person) turn off, and it is probably one of the most useful tools I have to keep me on schedule. Even though my Pavlovian response is to scream at the screen, "LEECHBLOCK YOU DON'T TELL ME I CAN'T GO ON TWITTER I DECIDE WHEN I CAN GO ON TWITTER," usually I'm pretty happy that I'm not just spending my day cycling through an endless stream of distraction. Day --> saved.